At 6am this morning, Microsoft’s new CEO, Satya Nadella, sent his colleagues a long memo spelling out his vision for the company. He was thoughtful enough to post it on Microsoft.com for the rest of us to read, too. Microsoft was founded on the belief that technology creates opportunities for people and organizations to express and achieve their dreams by putting a PC on every desk and in every home. More recently, we have described ourselves as a “devices and services” company. While the devices and services description was helpful in starting our transformation, we now need to hone in on our unique strategy. For Microsoft, announcing that it intended to become a “devices and services” company was saying it wanted to be something radically different from what it had been for its first three and a half decades. Putting the “devices” part first was an especially big deal, since the company grew huge by selling operating systems and applications for other companies’ devices; hardware had always been a sideline. And Ballmer soon invested in the new vision by signing a deal to buy Nokia’s phone business. “Devices and services” was deeply influenced by Apple’s success with the iPhone and iPad, both of which showed how powerful–and profitable–it can be for one company to design hardware, software, and services, then integrate them into a seamless whole. It hinted at the possibility that Microsoft might eventually morph into a software company whose biggest customer was itself. Nadella’s positioning of Microsoft as a “productivity and platform company for the mobile-first and cloud-first world” also involves a sea change: Its traditional cash cows, Windows and Office, are still largely beasts of the old, PC-centric world. But the part about productivity and platforms isn’t disruptive–those are what Microsoft has always been about, all the way back to the era of BASIC and MS-DOS. And declaring that Microsoft must be mobile-first and cloud-first moving forward is pretty much stating an undeniable fact: Any tech company which doesn’t assume that its customers are using mobile devices connected to the Internet is in trouble. Does this mean that “devices and services” is dead? Nope. 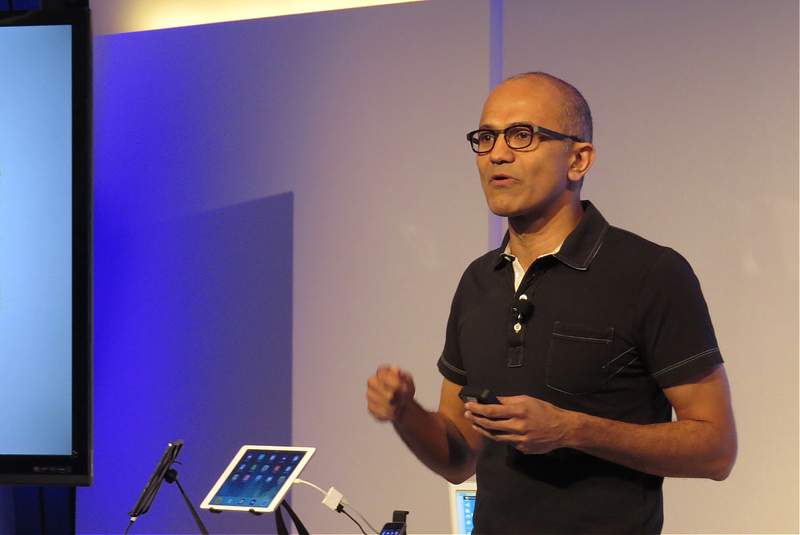 Nadella does mention the company’s Surface Pro 3 tablet and Nokia–but he does so only briefly, deep into the memo. Compared to late-era Ballmer Microsoft, that represents quite a demotion. There’s no reason to think that Microsoft’s new CEO is itching to get out of the device business–he also praises Xbox in his memo–but the change in emphasis suggests he isn’t planning to dramatically ramp it up, either. Stirring memos from big bosses only mean so much. (As an employee, I’ve sometimes received ones which bore no resemblance to what was actually going on at the company in question.) Still, Nadella is doing a good job of articulating where he thinks Microsoft must go. The next step is going to be translating that vision into a portfolio of products and services which are as essential to millions of consumers and businesses as past versions of Windows and Office have been. That’s going to be the tough part–witness the world’s refusal to embrace Windows 8–and it will be the measure which Nadella will ultimately be judged on. This is going to be fun to watch. Good analysis although I think the attempt to come up with and describe new mission statements is generally dull and meaningless – rarely helpful. Discussing products, specific transitions and plans is more likely to generate enthusiasm. Where did Steve Ballmer’s vision ever get them?